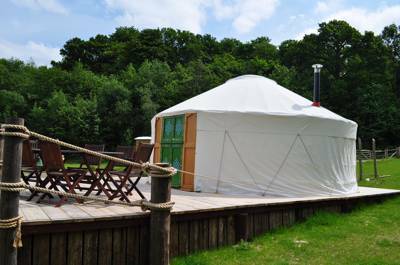 Inspired by nomads but rooted in Norfolk, this yurt enjoys a great position on a campsite in the Norfolk Broads National Park. Our beautiful handcrafted yurt, is an impressive 22 foot and sits at the top of our site, with gorgeous views. It sleeps a family of up to six people (max four adults and children), or four adults in comfort. Furnished with double beds and ethnic furnishings and complete with solar lighting, a fire pit, gas BBQ a deck area for dining al fresco and even a hammock for snoozing. Our yurt also comes with an outside fire pit and a gas bbq with an additional single side burner for that essential morning cuppa! The Whilingham yurt was specially handmade for us right here in the Broads and has been crafted, furnished and finished with love to make sure that it is a magical experience for everyone who stays. Beautiful wooden double bed with bedding provided. Two, solid wood double futons with super plush mattresses - please bring your own bedding. Wood burning stove inside, firepit outside. Price includes kindling & one basket of firewood, and gas for the BBQ. Gas BBQ with side burner for big cookups and making a brew. Large decked area with table and chairs. Check in is normally from 2pm - 7.30pm, check out by 11am - please check booking info. Our yurt comes with 1 car parking space situated immediately behind the yurt. Additional spaces are charged at £5.50 per day. Please bring along your own crockery/cutlery or other cooking equipment as this is not provided. Our yurt is super comfy but please remember this is still a canvas structure! You'll need to bring a torch for the night, sleeping stuff if there's more than 2 people, and plates, cutlery etc. A water carrier is available on request and the nearest water point is approximately 1 minutes walk away, just down the field, near the loos and shower block. The Yurt provides all the good bits of camping with added luxury, and a magical stay under the stars.